The contemporary arts centre at Carriageworks was a major redevelopment by the NSW Government. Carriageworks is located in the old Eveleigh Rail Yards, within the emerging Redfern Waterloo precinct. 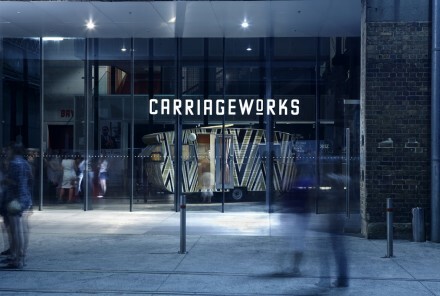 Carriageworks is the largest scale multi-arts organisation of its kind in Australia and its vision is to be recognized as a multi-arts urban cultural precinct that engages and inspires Sydney’s culturally diverse communities. It produces and presents a varied, multi-disciplinary program that explores contemporary ideas and issues by working with local and international artists from a range of cultures and communities, attracting over 400,000 each year. It offers two large flexible theatre spaces (one 800 seat capacity and one 300 seat capacity), a smaller space used as a gallery, three rehearsal rooms, a scenery construction workshop, exhibition spaces, offices, a bar and cafe. The centre is managed by Carriageworks Ltd and is a working hub for practitioners and audiences of the small to medium arts sector. Carriageworks Ltd also manages Bays 22-24 (located at the western end of the building), this raw space is available for hire for special events, in particular for creative industries and arts and cultural activities.